In Uganda, Gorilla permits are sold at Uganda wildlife Authority office and the permit goes for US$600 for FNR, US$500, and 250,000Ushs for EAC Rates include, guide fee, park entrance fees for the day and community development contribution. 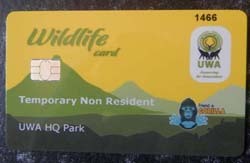 Visitors can also book their gorilla permit with a safari agent in advance. 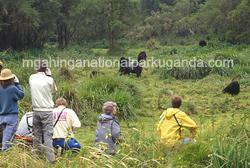 Uganda Wildlife Authority in conjunction with the Association of Uganda Tour Operators offer discounted Gorilla Permits during the low season in the month of April, May and November 2015 and a discount of USD250 per permit is given as they are sold at USD350 compared to USD600 in other. After breakfast ,a maximum of 8 visitors who are allowed to visit one family of habituated gorillas in day are taken for the morning briefing before starting to trek Gorillas, which may take them the whole day. Gorillas are trekked through the rainforest and bamboo covered slopes, accompanied by a guide and trackers, in search of a mountain gorilla family. The walking can sometimes be tough and long, but when you catch a glimpse of the magnificent silverback, any discomforts will be quickly forgotten. When the gorillas are sighted, visitors will be guided to within 6 meters from the gorillas, sit around them for a whole hour while gazing into their big round eyes. Mgahinga Gorilla Park is the only park when visitor can track the Nyakagezi gorilla group which frequently moves adjacent in the forests of Conga and Rwanda. Walking boots, or waterproof trainers. Hiking socks are recommended so that your trousers are pushed into the socks to prevent ant-bite. Layers are best, as conditions in the tropical rain forest can change from hot to wet and cold in an instant. Start with a long sleeved t-shirt; add a fleece and rainproof jacket and you should be right for all conditions. At some of the trailheads they have rain jackets for hire but this is not guaranteed .Mgahinga where the gorillas reside is a high altitude rainforest so come prepared for all conditions. Anti-histamine cream is useful if you get too close to any stinging nettles; the gorillas are immune to these, so often choose these stinging nettles as a place to rest. Thin, impermeable gloves are handy to prevent irritation from stinging nettles and thorns.